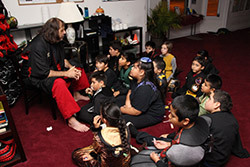 Costumes should be martial arts themed (things like ninjas, weapons, training animals, a punching bag, coming as a Sigung or martial arts movie star, etc.). If you don’t wear a costume wear your training uniform. Our school will be performing at the Milwaukee Christian Center at 807 S. 14th street (corner of National and 14th) on Friday November 2, 2018. All students are welcome to perform – but you must let Sigung Steve or Melodie know ahead of time! We will perform weapons, forms, self defense and some “breaking” of boards/bricks. Congratulations to our new ranks: Sergio N.M. (Blue), Sidi Cesar G. (Orange), Sidi Alvin X (Orange), Daniel S. (Yellow\Orange), Sidi Diego P (Yellow Star), Angel A.R. (Yellow), Sidi Marina A. (Yellow), Sidi Yuepheng (Orange). Friday November 9 at 5 p.m. (Block 2 material). Awards Ceremony at 6:30 p.m.
Sifu Jon Odishoo will be teaching a specialized class in Yoga for all students 12+ and adult on Wednesday, November 14 from 6:30 p.m. to 7:30 p.m. Juniors will have this as their class during their normal training hour. 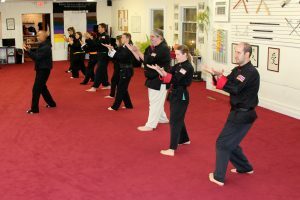 Tai Chi students likewise will have their class substituted with this special internal training in lieu of their normal time (7-8:30). All adults and parents of youth at our school may also try out this free class! Wednesday November 14 at 7:30 p.m. All teachers and assistant teachers invited. Rising Dragon Martial Arts will be closed Thursday November 22 through Sunday November 25 for Thanksgiving Day and Weekend. May you all have a wonderful family time and we will see you all back on Monday. Our family is grateful for all our students and our extended “Pai Lum” family! Business Meeting – Wednesday Nov 14 at 7:30 p.m.
Have a Kickin’ Christmas by putting a free uniform under the tree along with a training package at Rising Dragon Martial Arts for a family member, friend or relative. For buying a 1, 3, 6 or 12 month package you will receive a free uniform! Be sure to come get yours early! Wednesday December 19! 8 p.m. Please bring some cookies to share. Friday December 28 at 5 p.m. (Block 3) Awards Ceremony 6:30 p.m. Higher ranks will start earlier so check your test invitation! There will be no classes Monday December 24 (Christmas Eve), Tuesday December 25 (Christmas Day), Monday December 31 (New Year’s Eve and Tuesday January 1 (New Years Day). We wish you a Merry CHRISTmas and a Joyful New Years! Become a master teacher, improve your classroom management skills, equip yourself with training games, exercises, and teaching roles. All students green belt and higher are strongly encouraged to discover your hidden teaching talents and impact student lives! The annual White Lotus Association Teacher Seminar is tentatively scheduled for Thursday, Jan 10th from 7:00- 10:00 pm and Friday, Jan 11 from 5-9 pm. Testing Block 3 – Friday, December 28 at 5 p.m Awards 6:30 p.m.